Saved Sinnr's Blog ~ big city gal gone country! What a struggle this year has been ... I'm either up with high energy, or down and sleeping 15-18 hours a day... it's all to do with my health. 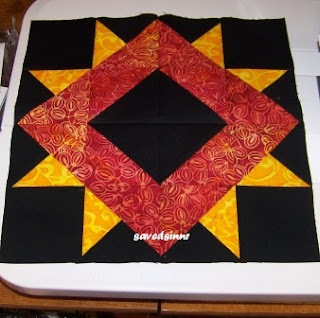 I HAVE been sewing ... working on a Quilts Of Valor quilt, and also a surprise for someone I love and will soon need a hug ... more to come on that later. Also, I decided to join a Relay For Life team, to help fundraising here in Christian County. My AWESOME friends have jumped in to help me in the fundraising, and have pledged donations to support the cause :) My walk is June 7th at Nixa Jr High. Wish me luck! What a DREAM Jenny is. She is a delight as well as a work horse! On the blocks for Relay quilt, I used the font function, and wrote on each square. I will post a pic as it gets more together. Karen has done her part on the blocks ... now to finish mine up, then it goes back to Karen for the quilting. Then I will do the binding, and HOPEFULLY it will be ready to start the raffle by Nixa Sucker Days, which is May 18th. We will be having a Relay booth selling nachos to help raise funds for the Relay walk, and we will also have the quilt there to kick off the raffle! OK ... broke the ice. Hopefully I can get my procrastination under control and keep posting on a more regular basis. I'm still working on reorganizing and shuffling my sewing room around, utilizing my guest room as an overflow area for my sewing habits. I wish I could just knock out a wall and expand my one room, but Steve's not real excited about the plans in my head... so I sold our guest bed and put in shelving. This week I also moved my bookcase in there, and having to move everything, has forced a much-needed organization of my books ... even found one I have as a duplicate, which I will share with a new to quilting friend. The sewing I've done over the last couple of weeks has been fun. I FINALLY completed a quilt for my Mom, for her 80th birthday. That in itself is a milestone, that she would live to be that old, as her life was so crazy reckless for the first two-thirds of her life, before she came to know our Lord.... and I must say, I am equally surprised that God has granted me life this long... as I AM my mothers' daughter. 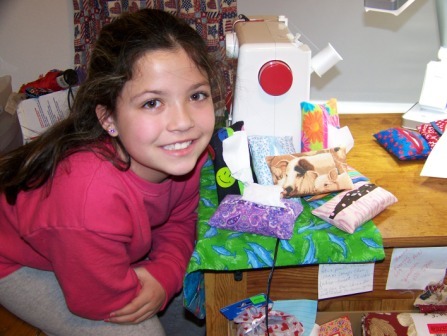 And that was the whole intent ... and IS the intent of why we make quilts ... to feel the love. I sure dislike it when non-quilters call them "blankets". The term seems so generic to me, and does not represent the time, workmanship and love that is put into a quilt. 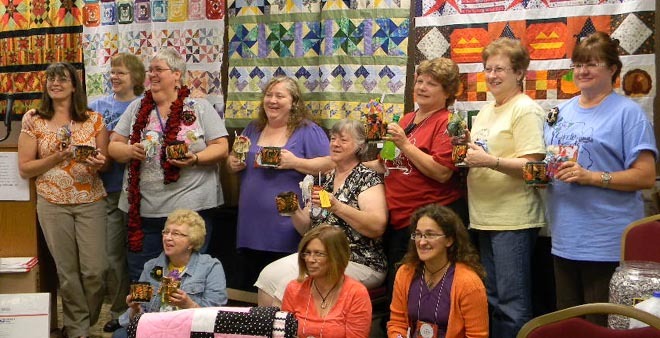 It's a LOVE thing ... and when you're a quilter, you want to share that love of quilting with those you love. Good Morning from sunny but NOT warm Missouri! Had a busy week... worked on getting that mess I call a sewing room together. YIKES! It's an ongoing process as I am moving some of my things into the spare guest room that can no longer house guests :) It just seems that my sewing items are like rabbits these days and are multiplying out of control. But with that change, comes organization! Which I so desperately need! I don't have alot of sewing to post, but I will say I'm beginning a new chapter in my daily living... will write more when I feel confident about it. Here's a pic I want to share, just cause I LOVE looking at my Precious G'daughter wrapped in her quilt I made her ... She is my heart, and my Precious gift from the Lord! Just wanted to wish anyone out there a HAPPY NEW YEAR ... and hope your new year brings you joy, peace, good health, the love of good friends and family, and many blessing of our Lord. I'm ready to start a new year ... AND I have a new friend to share it with. This is Jenny ... Jenny Janome is her name, and she is a dream! She and I have lots of plans this year, starting with the Block of the Month over at the HGTV Quilting & Needlework Forum. This is my block for January, altho I'm thinking of doing another color scheme also :) Two quilts would be better than one! :) I also have many goals for this year ... finish some UFOs I have collected ... do some quilts for Quilts of Valor, and the Ronald McDonald House, Mrs Claus doll quilts and a large quilt for MY bed done in batiks! I LOVE batiks! Here's wishing you and your family the BEST of what this new year has to offer! 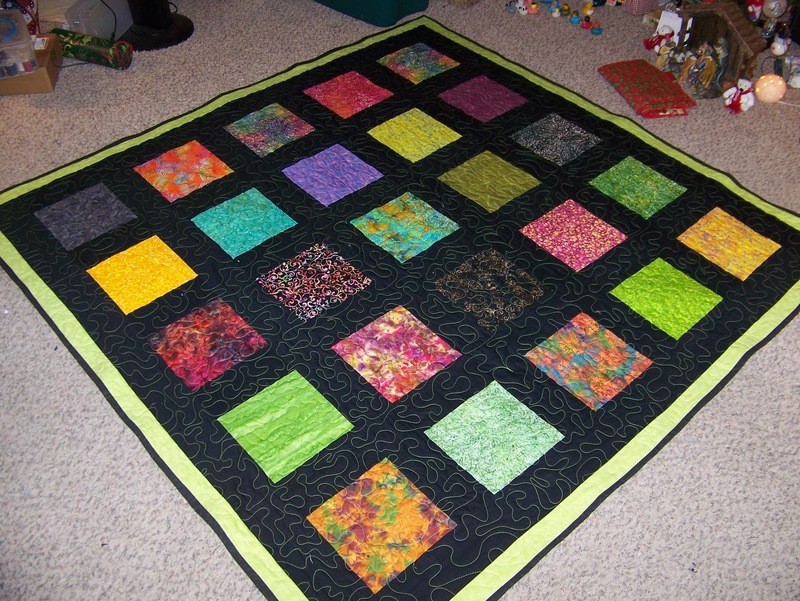 I wanted to share some pics of quilts I did for Christmas. 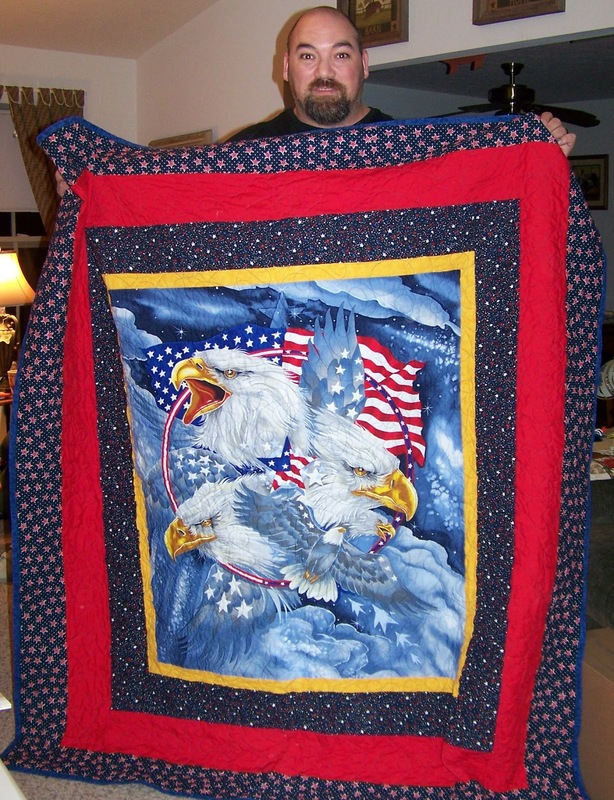 I've done quilts before, but they've always been for charities and such. After 6 years of dabbling with this stuff, I finally got serious and made quilts for my family. They were SO surprised! 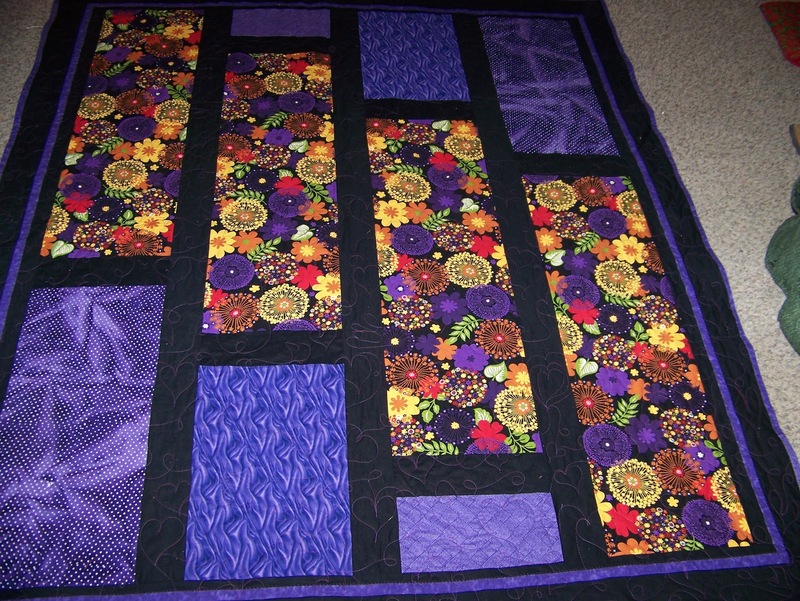 This purple beauty is made for my Precious g'daughter. She's the delight of my heart, and a precious gift from the Lord! 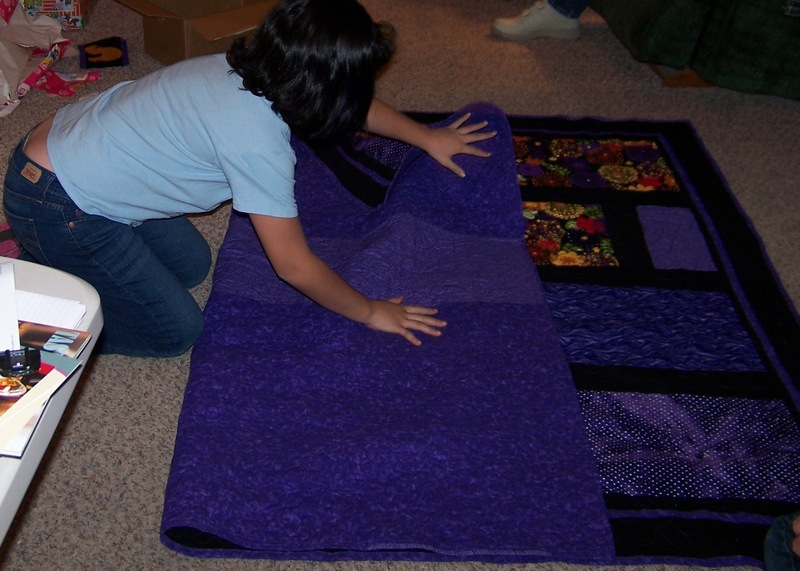 She LOVES purple, and she loves to sew and has even made some small quilts for her dolls. 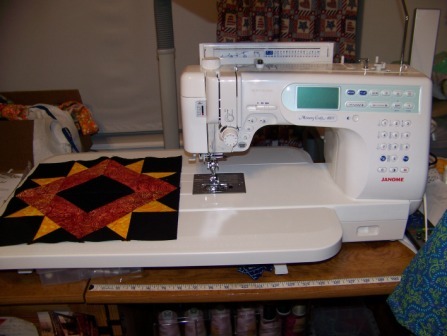 This year we will venture out into quilting even a little bit more! And because she loves the quilting aspect, I snapped her checking out all the detailing :) The quilting was done in variegated purple, all hearts and vines... cause she IS my heart! So 2013 is lined up to be MY YEAR for sewing! And I need to make my hubby Steve a quilt, and a quilt for my mom's 80th birthday... it's almost done :) THEN I get to make one for my bed ... king size ... and in batiks of course! Thanks for coming to visit my little neck of the web ... have a blessed day. I don't know bout y'all, but I am READY for a new year! 2012 was a busy BUSY year! But God is good... and He's good ALL THE TIME! 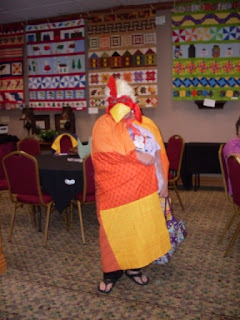 In Sept, we had the 2012 Circle of Friends Retreat in Branson ... it is a project of the HGTV Quilters & Needlework Forum on HGTV.com. They are a group of cyber friends who form friendships online, and sometimes we are fortunate enough to be able to meet them! I was that lucky last year and this year... and we had a GREAT time... lots of door prizes, lots of games, lots of good times and projects! We had some good teachers for our classes, and I think (I hope) everyone had a good time and enjoyed the festivities! I'd like to thank my AWESOME retreat team ... Crazy'boutquilts (Sandie), SDGranny (Mary), Shauna and Rainbow. Without all their help and support, it would have been a dud ... but they sure came through with lots of creative ideas, and kept me going when I had no energy left to give. THANK YOU FRIENDS! We also did the Crayola Challenge Quilt Raffle, which benefitted the new Ronald McDonald House just opened in Springfield, and it's their second! I think that say alot about the care for children that our hospitals offer! We gave away 26 quilts, and donated $3651 to the new House... and at the end of retreat, I took the leftover funds and bought a microwave for the new kitchen, as well as a Kitchen Aide mixer ... along with the ice cream attachment and a cookbook for ice cream! That way the families can come in after a long day and have some wonderful homemade treat! The volunteers who work at the RMH are wonderful, caring people, and I know the families are thankful for their support. OK ... after all that, I kinda fried my brain, but I am REALLY feeling good these days, and am ready for the NEW YEAR! 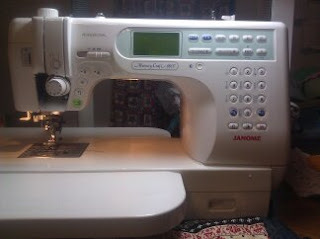 My Crazy friend has challenged me for next year ... we've decided that 2013 will be OUR year for sewing! 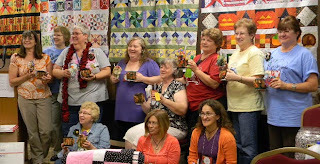 Lots of quilts, lots of volunteer projects, lots of FUN! 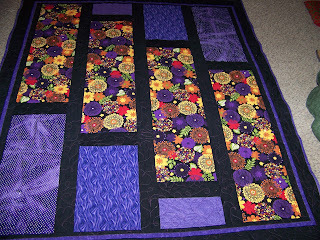 You can find the Crazy one over at her blog www.crazyboutquilts.blogspot.com . She's my mentor where quilting is concerned, and I would have given up a long time ago had it not been for her encouragement and support! Here's something I'd like to try to dress up my sewing room and get rid of all those plastic containers ... how about you ? This was her attempt at her first pattern reading on her own. We used the "almost free" tissue holder pattern we got from Ami Simms BLOG and it's a pattern from Linda Halpin. They both have some great tips and patterns and lots of GREAT reading! After choosing many different color combinations, Precious started sewing... and because she had not sewn for awhile, her confidence was way down... so my first answer to her is always for prayer, because I want her to learn to lean on The Lord for all her needs and cares. We pray alot together ... and we've always taught her to pray out loud, and she does so quite freely ... ah, LOVE that girl! So we prayed for her to not be anxious or fearful and then she takes a deep breath and dives in! :) She sews and sews and sews... and has made these holders for her mom, both GrGrandmas, her teacher, her old teacher, friends, and one to tuck into her back pack too! This Precious child SURE knows how to tug at her G'mas heart strings ... and I am SO VERY priviledged to be able to spend time with her and (hopefully) inspire her to do something she loves. She IS my heart! See why I call her Precious ??? She is my Precious gift from The Lord ! We left Missouri last Wednesday morning and flew to Chicago then on to DC ... nice flying! Checked into the Radisson @ Crystal City and only about 10 minutes out of DC ... so we are close enough to get there easy, and far enough away to avoid the masses ... but how can we tell? This is a noisy big city... seems like everywhere we go people are talking and talking, and no one listens! We've gone into restaurants, only to be asked to be set outside with the traffic and noise so that we could talk to each other and hear ourselves! Everywhere you go, people honk ... is it because they have horns? Or is it part of the noise factor for this neck of the non-woods? One thing I did notice, and was quite impressed with is the etiquette of non cell phone use in the restaurants and most public places... now there's a couple people we've run into that do... but for the most part, the people that live and work here either turn them completely off, or on buzz, and when they take a call, they go outside ... personally, I wish more of the country would adopt this behavior! We have had some of the BEST food ever! We started by eating at the Legal Seafood Restaurant, based out of Boston ... they have served their clam chowder at EVERY Presidential Inauguration since 1981 ... and OH MY GOSH! We can sure tell why! Steve and I eat clam chowder all over the place! We used to eat out every Friday night in the 80's, and every Friday night, we had clam chowder! Well THIS clam chowder has put them all to shame! It is the clammiest, the creamiest, the best balance of flavor we have ever tasted ... and I don't care what it costs ... IT'S WORTH IT ! We ate there for 2 dinners and a lunch while we were here! After 17 years without one, we are actually on vacation in WASHINGTON, DC! Thanks to our beautiful daughter, Melissa, and her generous hubby Jack ... THANK YOU BOTH SO MUCH FOR THIS AWESOME OPPORTUNITY and to realize a life-long dream. I guess I got side-tracked while on vacation, but will post some pics when I do this ... I learned today from my CRAZY friend that I'm supposed to post a pic with each blog ... I wish Publish Postthey put together a manual for doin this stuff! THANKS CRAZY ! Hey ... I'm Lindsay ! I LOVE being a G'ma... to my most Precious gift from the Lord! I live in the country where the wildflowers and wildberries grow in God's beautiful creation we call the Ozarks ! I've been married to my honey for 34 years...Life is good! (And time SURE flies)! I am blessed to have a wonderful family that God has saved, a loving husband who is the most patient man on earth, a daughter who still loves me even through the turmoil of our life before Christ, a son-in-law that treats her good and God is teaching me to love, and a grand daughter who is my heart. GOD IS GOOD, and He's good ALL THE TIME ! I love quilting, and don't sew as much as I'd like to, but will be working this year on prioritizing my time better and not allowing myself to be "sucked in" to pleasing others ... try to accomplish some projects I enjoy doing !